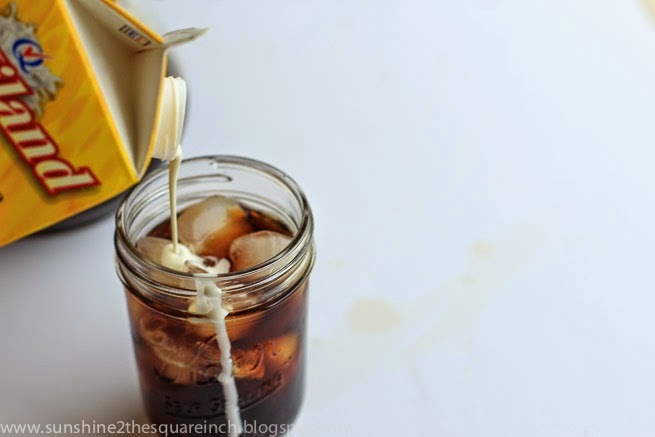 With Summer in full swing so is creating fun summer drinks. 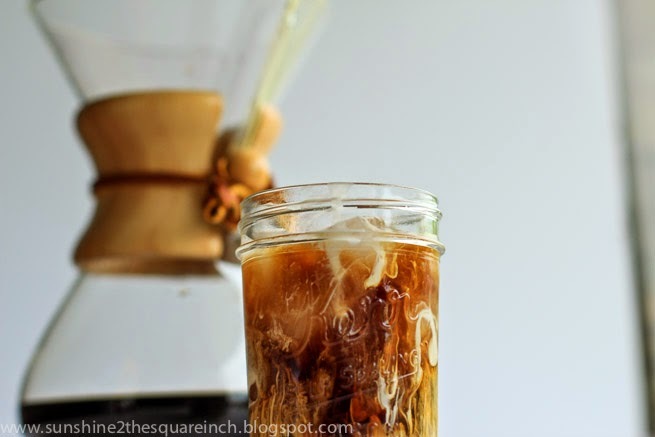 I've created brazilian limeades, blueberry lemonade, strawberry lemonade but today I'm sharing one of my favorite summer drinks ever - cold brew coffee. As you all know I'm a huge coffee fan and summer never stops me from drinking my hot morning latte. A couple of years ago my sister introduced me to cold brew. However, I forgot all about iced coffee until Alicia posted a picture and it gave me a huge craving! Alicia made a fun no-mess recipe and if you want to check out her batch you can do so here. One important thing to note is that the ratio is 1/2 c. of coffee for every 2 c. of water. 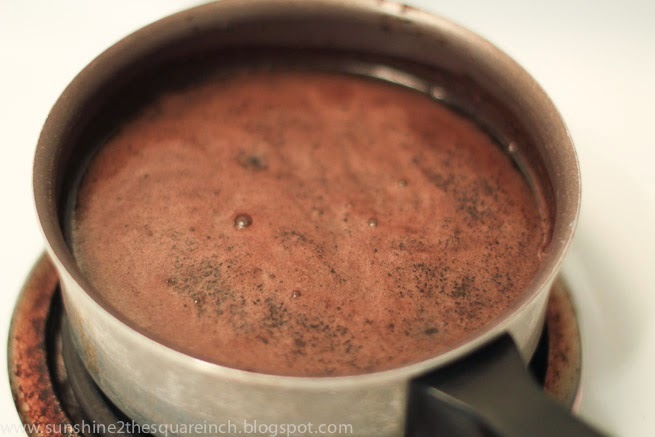 Add 4 cups of water, 1 c. of medium ground coffee and 1 tsp. of vanilla to a pitcher, pan, container (whatever you got on hand) and cover. Let it sit at room temperature for 8-10 hours. Then give it a good stir and re-cover it. Some people place their brew in the refrigerator but I don't feel like that releases enough of the coffee flavor. Either way will work though. I just like my coffee nice and strong so I leave it at room temp. 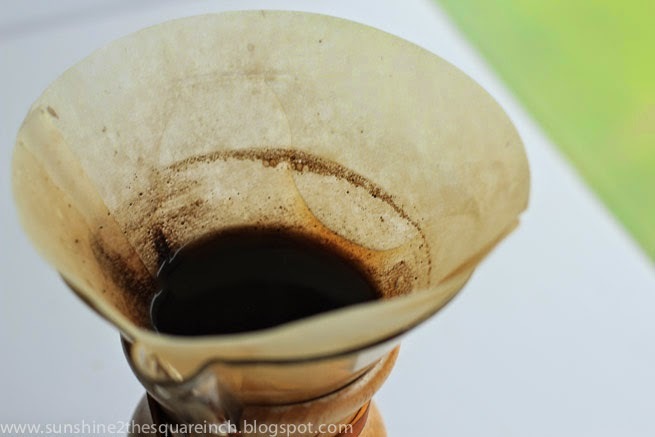 After your coffee has set for 24 hours you will want to strain your coffee. 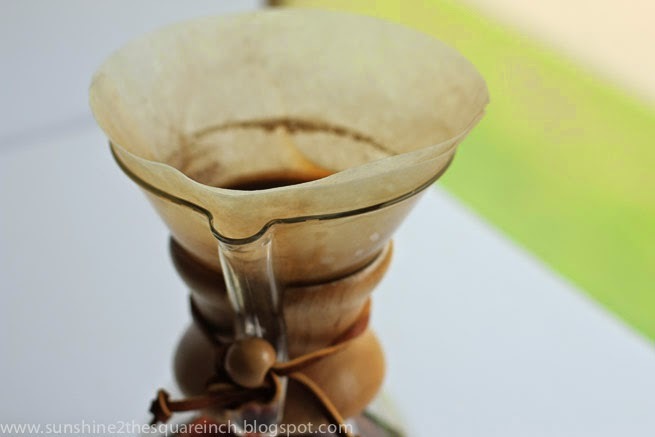 I use a Chemex but you can use whatever method you have on hand, even a cheesecloth will work. Also, you should know there is no magic number to the 24 hour thing. Sometimes I make this in the early evening and let it sit out until the next morning and it usually turns out just fine. After the coffee has strained and after you have taken upteen zillion pictures fill a glass with ice. 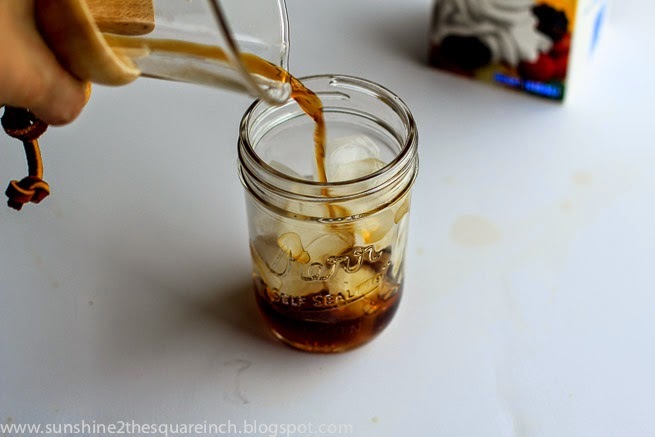 Pour the cold brew coffee right over that ice. 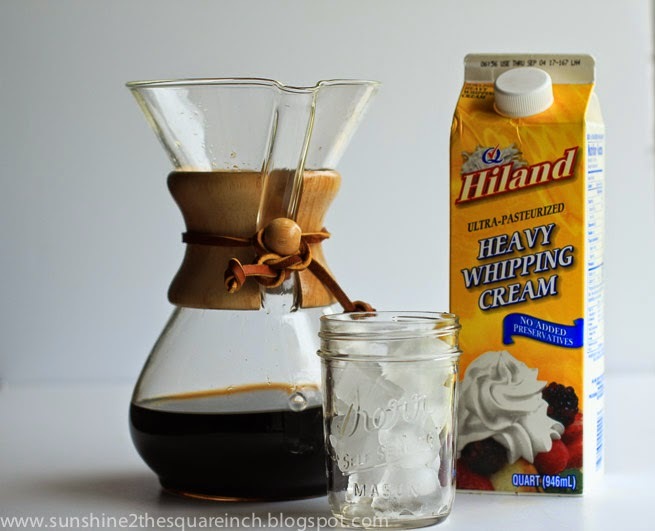 Then it's time to make some magic - grab your heavy whipping cream. Also note, you don't have to use heavy whipping cream - you can use sweetened condensed milk (I'm talking to you Aunt JB) or 1/2 & 1/2 or whatever you prefer. Then slowly and carefully pour a splash of cream into your glass. I was busy taking pictures and missed the glass. ha ha! You can't tell too much, right? 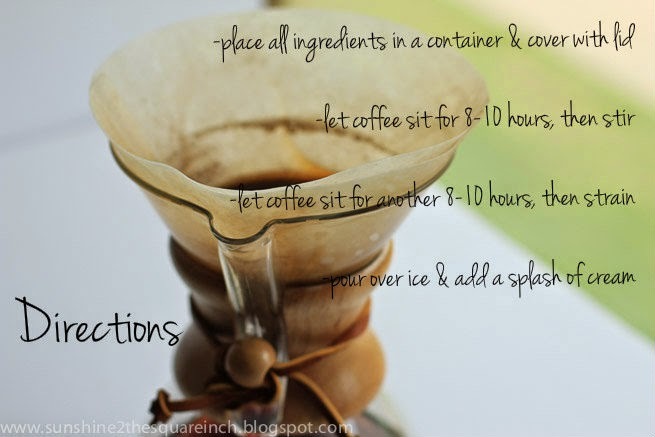 Place the water, coffee and vanilla in a pitcher, cover and leave at room temperature. Some people place their mixture in the refrigerator but I think that the cool temperatures don't allow the coffee to release all of it's flavor resulting in a weak brew. Approximately 8-10 hours in stir the coffee mixture and recover. After the coffee has set for 24 hours strain the coffee. 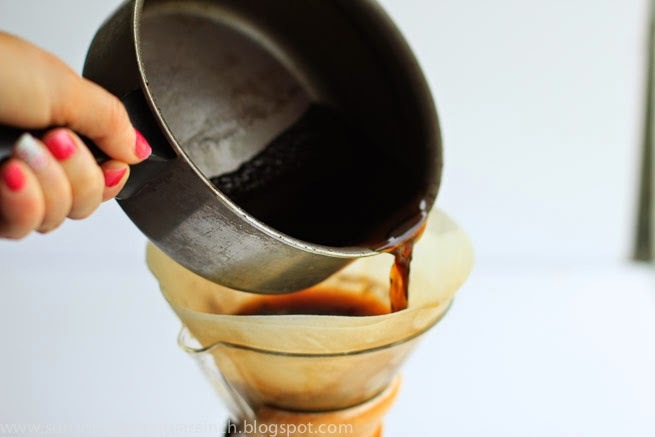 You can do this using a cheese cloth, a pour over method, a french press or a chemex. 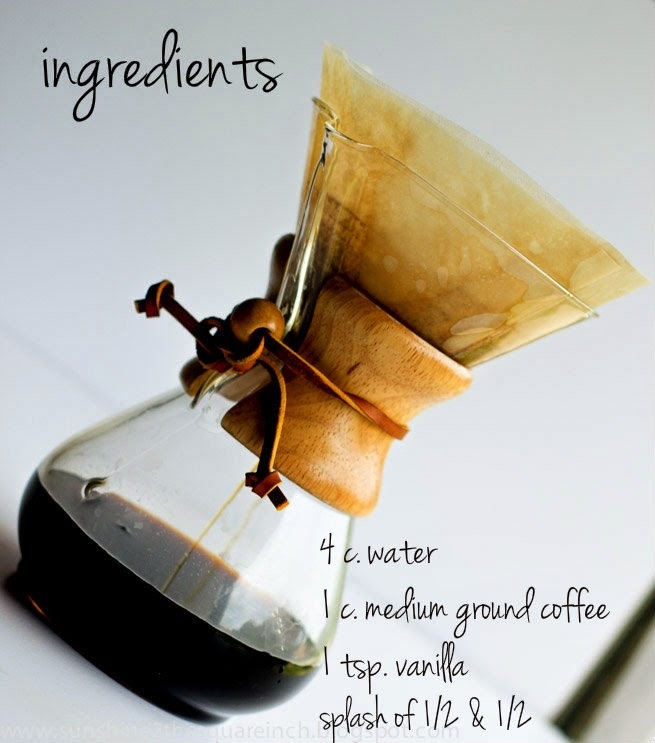 I use a chemex. 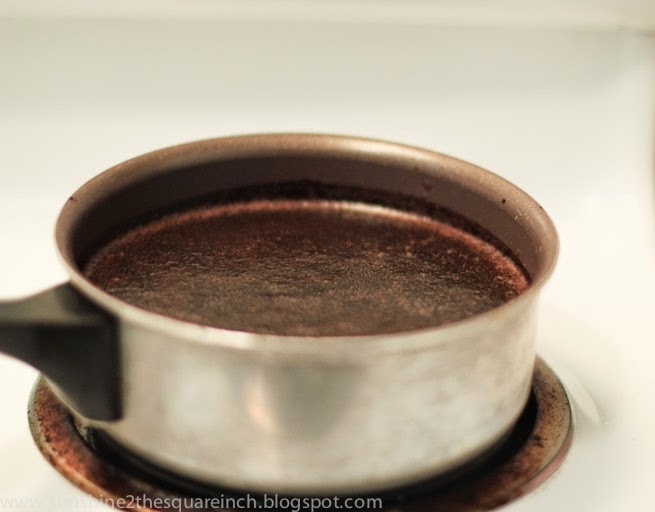 If you use a french press after you press the grounds out I'd transfer the coffee to another pitcher to prevent the coffee from getting bitter. Now go do a happy dance and enjoy that coffee! 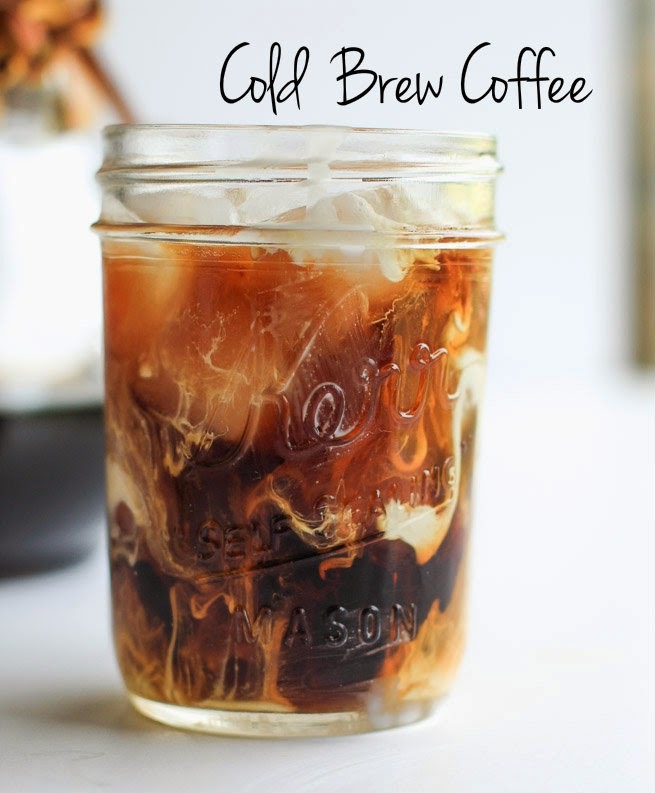 Do you like cold brew coffee? 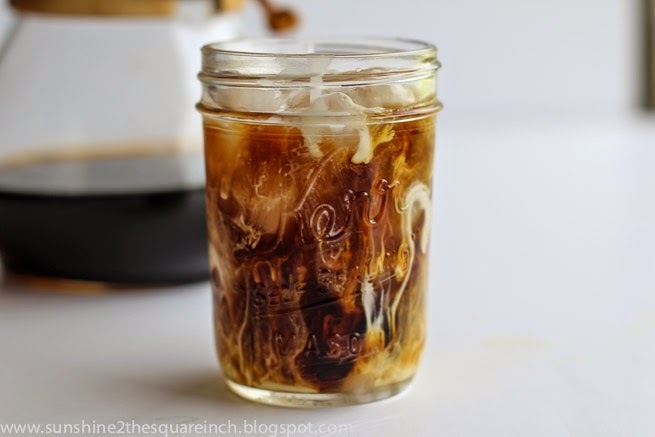 Have you ever made cold brew coffee? Also, if you enjoyed this recipe, would you be so kind to pin it or share it? Thanks! Yum! Such a great afternoon pick-me-up! I agree! It's so good! I love iced coffee....I've never cold brewed it though. I'm not sure I could wait 24 hours to enjoy it. I usually just hot brew a whole pot, prepare it like I normally would, and then refrigerate it to get it to the desired temperature. Does that make me a cheater? I guess, that being said, because I do a whole pot, much of my coffee does sit for over 24 hours getting cold so maybe I ought to try cold brewing. Yum, yum, yum - and it looks SO pretty too!! :) Great recipe. Can't believe it takes 24 hours to brew, I had no idea. 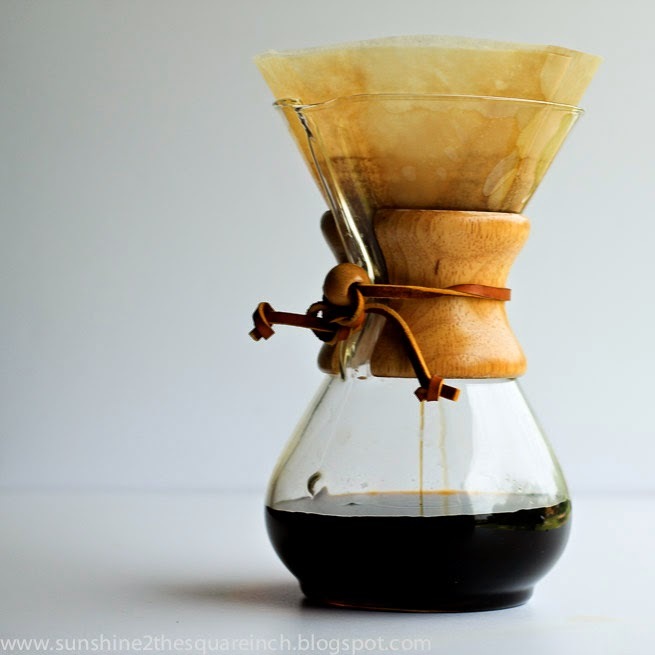 Question: what's the thing you brew the coffee in?? Thanks for sharing! You can brew it under 24 hours it's just the 24 gives it a good flavor. I've brewed some before going to be and it strained it the next morning. Also, you can make a huge batch and have it for a week. Where do you live? I hope you do get to make this recipe! It's super fun and good. I just mixed up my first batch! I can't wait to try it tomorrow! Thanks, Lauren! I had so much fun taking these pictures. It's crazy how some blog post pictures are just super fun and others are work. This was a fun one! I tried it a couple hours ago. My husband taste-tested it also. We both love iced coffee and it tasted great on this warm afternoon! 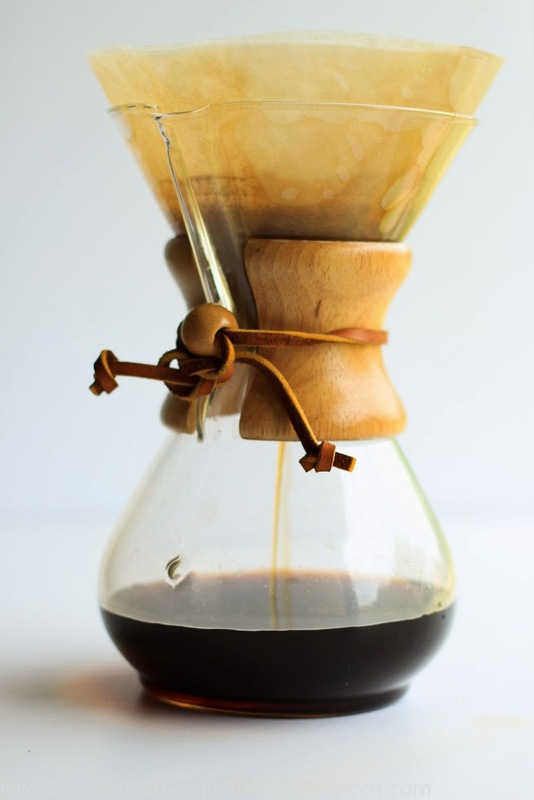 We are intrigued by the Chemex. We may have to put it on the Christmas list!